We’ve finally taken cat #2 into the Xavier clan. His name is Bjorn. 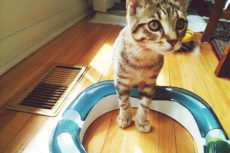 Yup, he’s got a Persian face – not an ordinary tabby by any stretch. 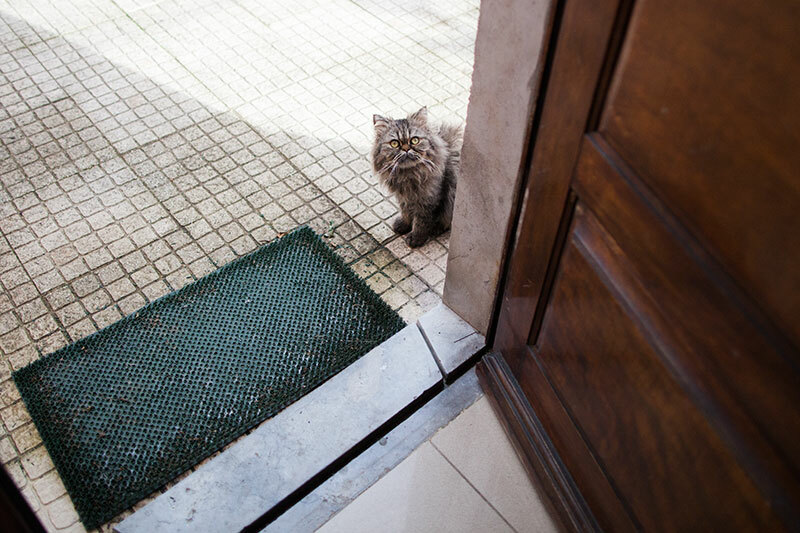 For the longest time, we assumed Bjorn belonged to the same family the three other Persians did (who we labelled “The Three Musketeers” and named after the characters as well), but as clues kept cropping up, we realized he was actually homeless. (Want to read his full story? 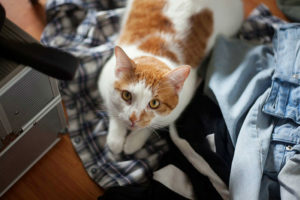 Check out this article on my personal blog: Our New Cat Knew: Stick Around Long Enough, They’ll Let You In). Upon first taking in Bjorn, even though we’d been hoping for ages that we could, I still had what felt a smidgen like cold feet. 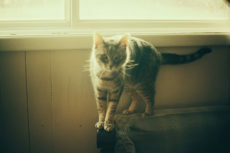 I wanted to write about my thoughts, doubts, worries, and fears, so those who encounter the same fleeting or overbearing thoughts wouldn’t think they were the only ones to feel insecure about taking in a new cat of their own. I also believe discussing less-than-savory emotions you have toward your pet, while taboo, is incredibly important. Bringing awareness to the fact that these thoughts and feelings are normal, discussing why we have them, and trying to work through them is as healthy to me as discussing and trying to solve any other problem in life. If you let the negative emotions stew, don’t get them out, don’t try anything to fix them, you can end up hating your cat, and while I think some types of resentment toward a pet can’t be resolved, I do also believe most can, through understanding your cat’s needs and trying to meet them in a way both they and you are happy with. I also think it’s incredibly encouraging when you learn others have gone through the same experience and have found solutions to their problems, all working out in the end. You’re not a bad person because you go through the very valid, human experience of not being 100% positive about your pet. Just remember that if you find yourself in the same boat. Now let’s go through some of the negative things that flashed through my my mind our first few weeks having taken in Bjorn. 1. What if Bjorn had parasites? Could Thomas and I have gotten worms from him as well? It’s definitely not likely, but humans do sometimes get parasites from their pets, especially with things like worms. The idea of having gotten parasites from Bjorn stressed me out a little, though not at all much compared to the other sickness & potential spread worries I had. 2. He keeps sneezing. What if he’s sick with something the vets didn’t notice and he gets Avery sick? This used to bother me a lot, but I hoped that he’d only been sneezing because of pollen or some other outdoor allergen, and when he was inside, his sneezing would stop. Luckily, this seems to have been the case, as within the first week of Bjorn being indoors, his sneezing slowed to a near halt. 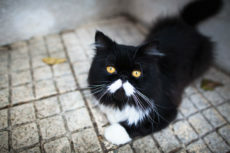 He still sniffles and will definitely sneeze every once in a while when sniffing very hard, but this is normal for a Persian anyway, so I’m exited this potential issue resolved itself quickly. 3. What if he has a lot of health issues in the future due to his breed? 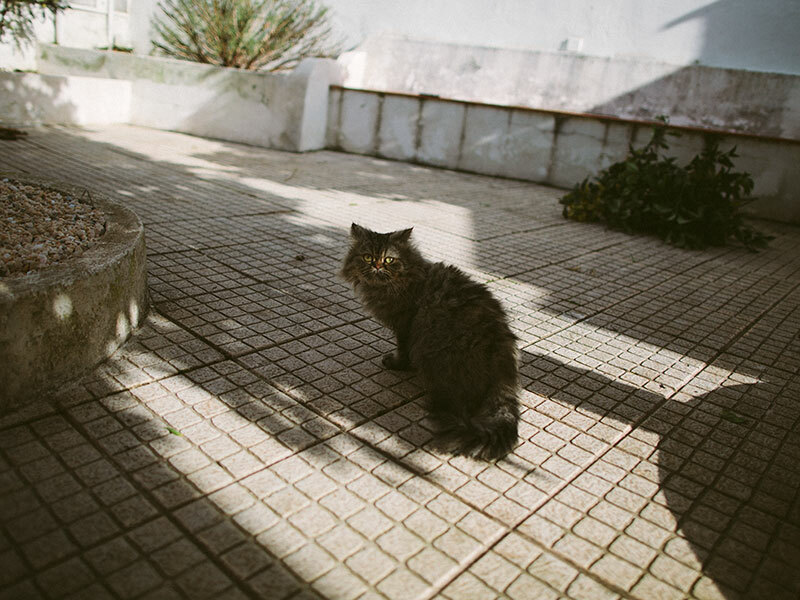 This is a question Thomas asked that had crossed my mind while he was outside, but quite frankly, the price of vet bills is much cheaper here in Portugal than it ever was in Canada or the UK, so I’m confident we could tackle any issues that may arise without too much financial stress. In Canada, I definitely feel I’d worry one heck of a lot more over this issue than I do here. 4. Is he going to live a short life due to being part Persian? Again, this is a question Thomas asked that I was also pondering while Bjorn was outdoors. 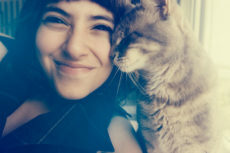 I hate the idea of being parted with any cat I care about, and if that cat has an early death, I know I’d be devastated. While Persians do have shorter lifespans than non-Brachycephalic breeds, I know that the kind of life we’d give Bjorn, away from the threats of the outdoors, continuously fed high quality cat food, with regular visits to the vet, he’ll live as long as he can with us. And knowing that we’ll help extend his life under our care is definitely good enough for me. 1. What if he refuses to use the litter box? This was a complete non-issue. We have two Modkat top entry litter boxes, and took one downstairs for him to use. He did quite a number of times, but once while we were with him, pawed on then immediately after used a cardboard box to pee on instead. The next time he started pawing into cardboard, I placed him on the litter box, and he started to go in, but before doing any business, came back out. So I took the top off and placed him in directly, without the cover, and he went. 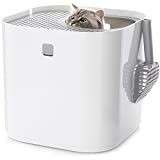 I believe there’s a chance he doesn’t like covered litter boxes, as there are cats who refuse to be covered while using the kitty loo. But more likely, I believe what explains his behaviour is that his matted fur, ever so long and likely painful, kept touching the top of the litter box while he was using it and this bothered him. I gave him two Modkat litter liners filled with World’s Best Cat Litter as temporary boxes (they work great for that, by the way! So much less mess than most intentionally made temporary litter boxes), and he’s used these religiously with no accidents on cardboard since. I placed the second Modkat litter box back upstairs for Avery. Once Bjorn is free to roam the whole house, I’d be interested to see whether he uses them (he’s been shaved of his dreadlocks). Either way, for now, the liners + litter are the perfect combo for him. 2. He’s throwing up. What if he does this regularly and on surfaces that are not easy to clean? 3. His hair is so long and curly. What if he keeps getting it knotted or gets a lot of hairballs? 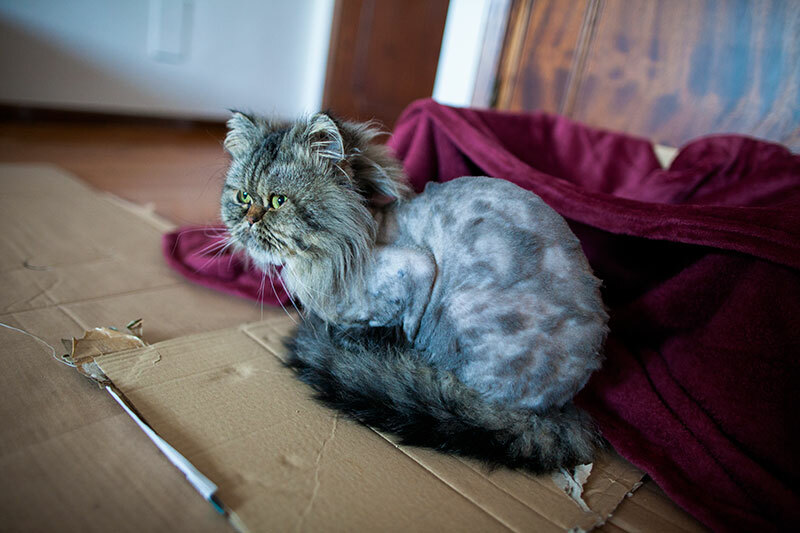 I will brush him to reduce the chance of this happening, but if it happens anyway, I will definitely figure out how to shave him down to a pretty little lion cut, or pay for it to be done if I can’t do it myself. 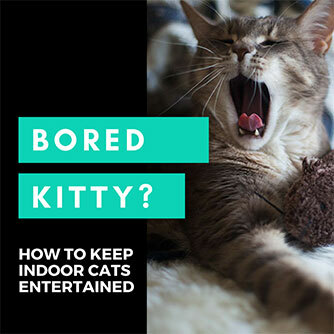 I don’t want him having issues with hairballs and knots if they can be so easily prevented. 4. What if Bjorn gives Avery hairballs as well because they allogroom? Again, if he’s got a lion cut, this should definitely not be an issue. Still, it crossed my mind. 5. What if he tries to mark territory by peeing all over the house? 1. What if Bjorn makes Avery feel unsafe in his own home? Such a stressful thought, and one I don’t think is likely considering Avery even got along well with my mother’s cat Walker – who was a bit of a bully – after around a month of we living in the same house with him, but where we had them separate unless monitored. Still, it’s not nice to think your cat could feel this way for any reason at all. 2. What if Bjorn tries to attack Avery? How will I feel if Avery is injured? Even if they eventually got along, if the two cats had a physical fight and Avery was injured, it’d break my heart. 3. What if Avery tries to attack Bjorn? How will I feel if Bjorn is injured. Obviously, I worried about things the other way around too. Imagine how unwelcome and unsafe Bjorn would feel if he were injured, especially if Avery hurt him while he was still growing out his peach fuzz, or full on hair, directly after being shaved. That would definitely hurt! I don’t think I will let them anywhere near each other for prolonged periods of time until Bjorn has at least some fur back. They have met a few times and we let Bjorn out around once or twice a day to explore the house. There’s been plenty of hissing (all Avery, I think), but luckily no fights, though I think Bjorn feaks Avery out by being so darn spunky and quick. 4. What if the two cats never get along? Will I regret taking Bjorn in? This I really doubt will happen considering how well Bjorn got along with the other Persian cats outdoors. Still, it’s a worry that’s crossed my mind, especially coupled with the idea that Bjorn could make Avery feel unsafe in his own home. Not a pretty picture. 5. What if Avery has a negative personality change after Bjorn’s introduction? What if he never goes back to normal? 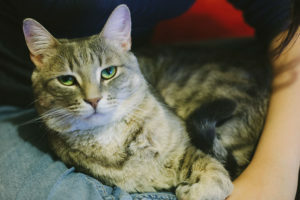 Sometimes, when you introduce a second cat into the household the first cat’s only-child, lap cat personality changes, and infrequently, the first cat never quite gets back to being so snuggly and affectionate as before. My brother once mentioned his first, attention-seeking cat, Beau, ended up going the opposite direction when he took in his kitten, Kalista, and both cats would compete for their humans affection instead. Obviously, I’d be happy with this or somewhere in between, I don’t want Avery’s personality to be less affectionate. I really am hopeful this won’t happen if the two cats are introduced very slowly, as I’m doing now. Avery’s been used to Bjorn’s scent for months since he smelled us having pet him while Bjorn was still outside. But also, as I said, I’m not going to let the two run around freely in the house together until Bjorn’s hair has grown back enough that I feel safe in case there might be some scratches thrown. I do hope that in combination with the fact that these two both have very similar personalities, in my opinion, will mean if they’re not the best of friends, they at least don’t get on each other’s nerves enough to make personality changes happen. So far, so good, but we shall see. 6. Is there a point where I will feel I’ve sacrificed my old cat’s happiness for my new cat? If Avery ever felt unsafe or his personality changed after Bjorn’s introduction, I think I would definitely feel this way to some extent, and it would tear me up. I don’t want Avery to ever feel as though his life with us is not as good. Really hope it never comes to this, and I don’t think it will, but again, I’ve thought about it. 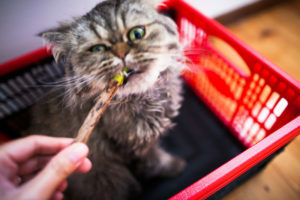 Your Experiences with Negative Thoughts over New Cats? 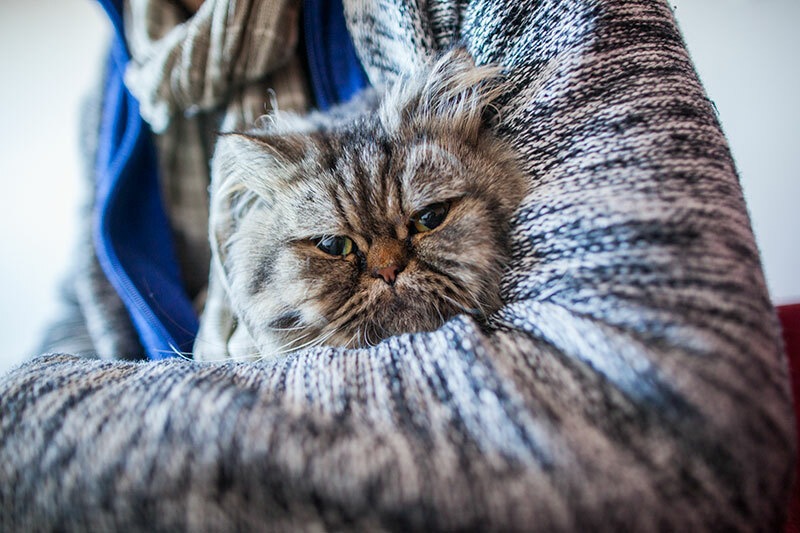 Have you ever experienced negative thoughts just before or just after taking in a new cat? What were these thoughts about? Did your worries and stresses ever come true? Were they ever resolved? How did you solve them? 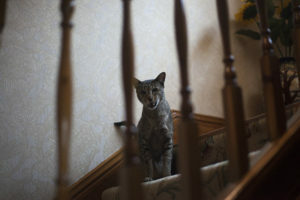 What would you advise those taking in new cats – whether or not they had old ones – about their fears and negative emotions that may have cropped up? Any advice or thoughts on my new cat situation? Can’t wait to hear what you have to say in the comments down below! 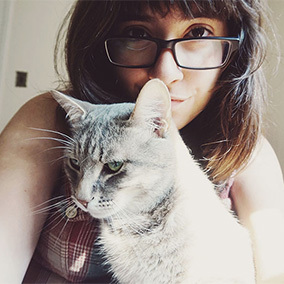 7 Gushy Reasons I Love My Cat, Avery, to Bits; What Are Some of Yours? 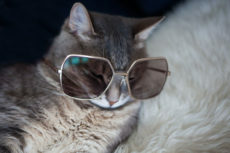 Cool Cat Names for Kickass Kitties with Poppin’ Purrsonalities! I’ve got a lovely 18mth old cat called Church who I will get getting a friend for in the next couple of months. He currently lives with our 12 rescue dog, he always wants to play and shes not interested, and there is only so much play we can give him so I feel it would be beneficial to him to have a feline friend to have a chase and wrestle with. Hes met cats before when my neighbour has looked after him with their two cats (their cats aren’t interested and will hiss at him to leave them alone for play time). 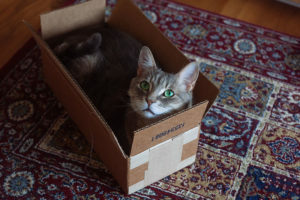 We will also be moving to a new apartment in the next 6 weeks, so I am hoping to re-home the other cat about the same time as we are fully moved in. I am hoping that the new, neutral territory, Church wont feel like his territory will be intruded on too much. So I guess any advice? Should I keep the new cat separate to start with and let them meet in short supervised forms? I also have to consider the introduction to the dog, I don’t think she will be bothered too much (I hope). I would definitely keep them separate initially and let them meet in short, supervised visits. I think the dog should be okay with the cats, probably more confused about them than anything else, but the two cats in my opinion may need a little extra time to themselves to get used to their new home and life with you before then being introduced to each other. They should start letting you know if they’re “ready” to meet by sniffing at each other and trying to get through the door. 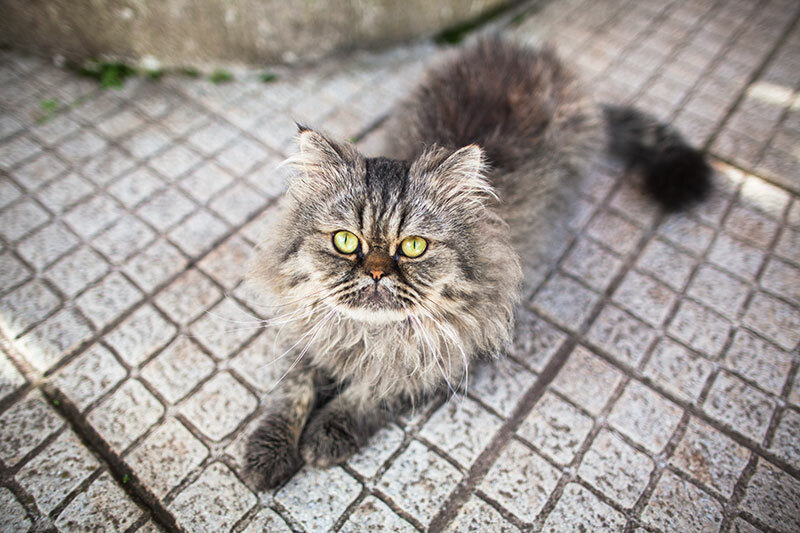 My guess is your new cat may be ready before your old cat, but with separation and supervision, things will work out in the long run, even if it takes time. First off, Welcome, Bjorn! What a beauty he is! Secondly, we adopted a female cat years ago, and she terrorized Chuck so much, that we returned her to the rescue, where she was adopted out to a one-cat only home. I was devastated by returning her, and we worked for over three months to get them integrated. Then, after Chuck died, we adopted Manny and Chili Bruce. Together, they are great, but Angel never got the hang of them. So, that’s when we chose to give her the upstairs apartment, while they have run of the downstairs. 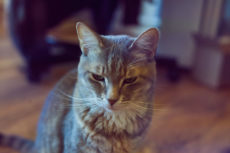 Angel is very skittish; she barely tolerates us…her humans…and she’s been with us for over 14 years! While I feel sad that 1) she is apart from everyone for long periods of time, and 2) I don’t get to sleep with Da Boyz (bedroom is upstairs), in the end, I know that this is the best solution for our family. Angel gets attention and play every day, and Da Boyz get even more because they want more. I hope that Bjorn finds his place in the family structure, and a hiss or swat from time to time isn’t a big thing; it’s warfare that you are trying to avoid! Good luck! I really hope it doesn’t come to having to rehome Bjorn. I don’t think it will considering how well Bjorn got along with the cats outside, but he honestly rushes toward Avery in a way that really freaks Avery and the two of us out, since it looks like he’s rushing to attack him. Thomas and I step in the way or scold him to the point where he freezes/stops. He definitely comes off too strong. Avery’s personality thus far hasn’t changed at all when he’s not around/when Bjorn is “contained” in Thomas’ arms, but my worst fear right now is as soon as we start letting Bjorn out, he’ll repeatedly hurt or bully Avery. I do think it’s unlikely, still I’m nervous/scared, as we get that sudden rush toward every every time he’s let out.